The Seven Network has scheduled the Fast Forward comedy special, The Making Of Nothing, to go to air later in the month. The one-hour special is described by executive producer Andrew Knight as “a documentary voyage that will prove a stimulating, incisive expose of the trials and tribulations behind the glamour of your average run-of-the-mill auteur. For the average run-of-the-mill viewer, this is a hilarious spoof featuring all your Fast Forward favourites, with guest star John Doyle (Rampaging Roy Slaven) and several other big names who wish not to be named in connection with the film.” Celebrities who “may not wish to be named” include Cameron Daddo, Hugo Weaving, Genevieve Picot, Ivan Hutchinson, Annette Allison, David Stratton and Margaret Pomeranz. 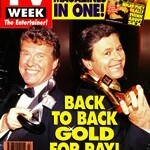 Sale Of The Century now has its new co-host, model Nicky Buckley (pictured with host Glenn Ridge). Her appointment comes after the quiz show spent much of the second half of last year working with guest co-hosts, one of whom was Buckley. She is a former co-host of the Network Ten game show Blind Date and had been a model on Sale Of The Century in the past. Her husband, model Murray Bingham also appears on the show. 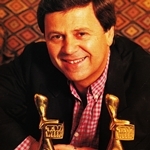 As former Midday host Ray Martin (pictured) was preparing to take on the host’s position on A Current Affair, he told TV Week he got a ‘welcome’ message by fax from his former 60 Minutes boss and producer of rival program Real Life, Gerald Stone: “Congratulations on a class act. Welcome to the real world. We’re going to whip your a— — the viewer will be the winner!” Martin responded, “he shouldn’t have said it because he’s going to live to regret it. It’s a nice red rag to a bull. The reply will be in the ratings.” Martin also says A Current Affair is in for changes. 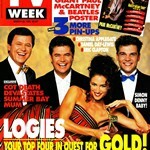 “Current affairs (shows) have become sleazy, there’s too much foot in the door,” he told TV Week. “I think we can reflect a society that is much better than most others we know in terms of a place to live.” Meanwhile, former current affairs host Derryn Hinch is ready for his big career change — taking over as host of Midday. “I have big shoes to fill and I know it’s daunting,” he told TV Week. “I have no illusions that it’s going to be easy. Seven-and-a-half hours of live television a week is a lot of television and a lot of interviews and a lot of research. And, because of the nature of the beast, it’s stuff you have to do yourself.” As to Hinch’s shock exit from Network Ten, it was a harsh outcome of some internal politics at the network but he has resolved not to comment on the situation or his replacement, Sydney radio man Alan Jones. 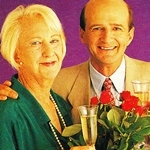 As Mother And Son returns for its 10th year, actor Garry McDonald (pictured with co-star Ruth Cracknell) credits the show for helping him overcome his much-reported nervous breakdown a year ago, triggered by the pressure of the launch of his series The Norman Gunston Show. “I was absolutely thrilled when they said, ‘We’re doing another series of Mother And Son‘, because I was immersed in absolute chaos and I knew I was in big trouble. 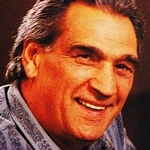 Now I’m back to normal,” he told TV Week. Saturday: Today’s sport includes the Mercantile Mutual Cup (9.50am, Nine), live from Bellerive Oval, Hobart. ABC’s weekly review of Federal Parliament, Order In The House (11pm) returns this week. Sunday: With the ratings now in full swing for 1994, Business Sunday (8am, Nine), Sunday (9am, Nine), Meet The Press (11.30am, Ten) and 60 Minutes (7.30pm, Nine) return for the new year. Sunday night movies are Soapdish (Seven), My Girl (Nine) and Backdraft (Ten). Actress Ruth Cracknell is profiled in the one-hour special It’s Ruth (8.30pm, ABC). 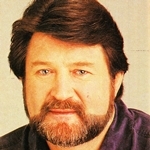 Monday: Daytime programs Ernie And Denise (9.30am, Nine), What’s Cooking (11am, Nine) and Midday (12pm, Nine) all return for the year — with Midday now hosted by Derryn Hinch (pictured). In Neighbours (6.30pm, Ten), Cheryl (Caroline Gillmer) has become the major silent shareholder at Lassiters. Sale Of The Century (7pm, Nine) returns with a new Celebrity Challenge series. In the series return of Mother And Son (8pm, ABC), Maggie (Ruth Cracknell) goes missing after Robert (Henri Szeps) takes her out for a drive, while Liz (Judy Morris) finds out about Carmen (Tina Bursill). Tuesday: Jo Beth Taylor returns with a new series of Australia’s Funniest Home Video Show (7.30pm, Nine), followed by the special A Word From Our Sponsor, looking at some of the world’s funniest, silliest and award-winning television commercials, hosted by Steve Jacobs. Wednesday: In Home And Away (7pm, Seven), Angel’s (Melissa George) quest for visiting rights with her son ends in disaster. In Newlyweds (8pm, Seven), Jules (Cathy Godbold) shocks the family when she announces that she is moving in with a 36-year-old photographer. Thursday: In Beyond 2000 (7.30pm, Ten), Caroline West jumps out of a plane to try out a new computerised automatic backup parachute system, Andrew Waterworth checks out the latest gadgets on display at the Japan Electronics Show, and Anthony Griffis investigates claims that San Francisco’s Golden Gate Bridge could collapse in the city’s next major earthquake. Ray Martin hosts the one-hour special Graham Kennedy’s 60th Birthday (8.30pm, Nine), featuring various footage of Kennedy’s career including In Melbourne Tonight. Friday: In Home And Away (7pm, Seven), Mrs Harris (Judy Walker) puts her trust in Angel (Melissa George), allowing her to see Dylan (Jimmy Lucini) next week. In The Great Outdoors (7.30pm, Seven), Ted Egan visits Esperance, Western Australia; Ernie Dingo continues his journey through the MacDonnell Ranges; and Bridget Adams visits the miniature world of Cockington Green, outside of Canberra.